Our first stop was Barcelona where we had four days and four nights plus an extra day/night on the back end to get a taste of Spain’s most famous Catalan city. We were a bit apprehensive given all the political turmoil that’s been happening in addition to the recent terrorist attack on Barcelona’s most famous walking street, Las Ramblas, but we had no trouble at all during our stay. We were always prepared with an exit plan and were hyper-vigilant about our surroundings at all times. It was still a bit of a weird feeling that I felt more at ease traveling in several developing countries in Southeast Asia over Europe. 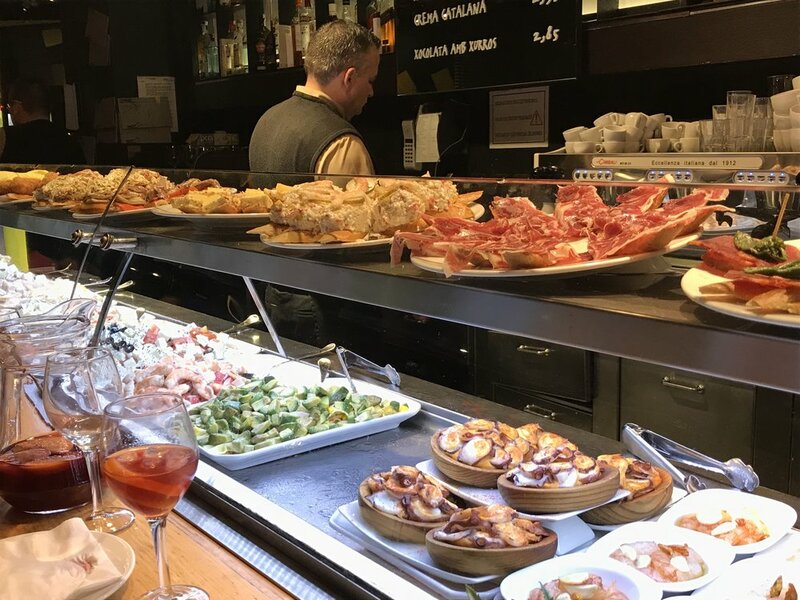 Barcelona has a bit of a laid-back beachy feel and some amazing neighborhoods in which to wander, pick a plaza, pull up a chair and relax and watch the world go by with a Vermouth or glass of wine. Barcelona also had some of our favorite touristy sites in Spain, Gaudi’s amazing architecture, and favorite walking streets. If you’re looking for the perfect five-day itinerary that hits up all of Barcelona’s best sites, but still allows you to take the city at your own pace look no further! We really made an effort not to cram too many touristy activities into our days so we could try and get more of a local vibe for the city. How to get from the airport to your hotel: We arrived in Barcelona around 9:30am and upon recommendations from many other travelers took the Aerobus from the airport straight to Plaza Catalunya for a cool 5 Euros a person. The ride took around a half-hour and the buses run every 5 minutes so you almost have less of a wait time than a cab! If you’re a tourist you’ll likely be staying somewhere around Plaza Catalyuna as it’s the main center of the city with more than a half-dozen metro stops, so it’s easy to get anywhere around the city. It’s also near Las Ramblas which is lined with shops and restaurants and runs in the middle of the Bari Gotic and El Raval neighborhoods. Where to stay: We decided to book a room at the Hotel Jazz which came highly recommended from both my parents and some good friends. It was walking distance from Plaza Catalyuna and near several different metro stops. They have a great rooftop where you can swim and lounge in the summer and even when we were there it was a wonderful place to have a drink and watch the sunset. If you stay there make sure you don’t miss out on the bakery next door which had the best croissants I’ve had outside of Paris. The going rate was about USD $150 a night, but less during the off-season if you booked directly through the hotel. You can also book Hotel Jazz through most bank’s points systems to score a room for free! There are A TON of budget-friendly 2 and 3 star hotels in the area so don’t hesitate to shop around. Spain’s daily schedule: If you get in early, don’t stress about taking an early morning nap before setting out to explore. It will get you on a better schedule and you won’t miss out on anything because it seems like everyone in Spain is a late sleeper. In fact, most places don’t open until 11:00am or later. Most people have a large mid-day meal around 2:00pm and don’t eat dinner until 9:30/10:00pm or even later. Even though we don’t mind eating late, we thought the adjustment may seem strange but we were surprised how simple it came and really extended the day. The best part of Spain’s daily schedule is you get to take a siesta after your mid-day lunch and digestif (after lunch beverage)! Even if you don’t feel like napping, we found it helpful to relax for a couple of hours in the afternoon before heading out for a pre-dinner drink. Lunch specials: Hundreds of restaurants around Barcelona offer a special “menu del dia” or lunch special that usually includes a beer or glass of wine, appetizer, entrée and either a dessert or café con leche. They vary from 10 Euros to 20 or more, but are always a good deal. It’s a much better value to have a larger lunch and then just a few drinks and tapas for dinner, especially when you’re eating so late. Embrace the tapas bar: If you really want to blend in with the locals you should embrace eating like one! The most vibrant and fun dinner experiences we had weren’t formal reservations, but ones where we lurked behind other eaters waiting to claim our spot, and finally bellied up to the bar (most of the time standing room only) with a glass of house wine and a few shared plates. Look out for a later post about must-eat dishes in Spain! Enjoy a plaza: Some of our most fond memories in Spain involve picking a neighborhood to explore and discovering all of the sunny plazas within them. Most plazas are lined with cafes and restaurants and it’s perfectly acceptable to choose one and linger for a while with a bowl of olives and glass of wine or pint of beer. Plaza del Sol in the Gracia neighborhood happened to be my favorite. It was a Sunday and packed with residents sitting on the steps, making music, and enjoying time catching up with friends. Drink house wine: Most house wines at bars and restaurants run between 2.5 to 5 Euros for a glass (cheaper than water in some places!) and are usually easy drinking and pair perfectly with a snack of pedron peppers or olives. Ask for a “vino tinto”!